(via NASCAR Wire Service) JOLIET, Ill. – Justin Allgaier had the drive of his life. Brendan Gaughan was hanging on for dear life. But both drivers were winners at Chicagoland Speedway. Grabbing the lead with a bold move to the inside after a restart on Lap 186 of 200, Allgaier, an Illinois native, captured the big prize at his home track—a victory in Saturday’s TheHouse.com 300 NASCAR XFINITY Series regular-season finale. Gaughan rallied from an equalized tire that put him three laps down to finish 13th on the lead lap and nail down the final spot in the NASCAR XFINITY Series Playoffs. With a push from regular-season champion and JR Motorsports teammate Elliott Sadler, Allgaier powered his No. 7 Chevrolet to the bottom entering Turn 1 on Lap 186, passing both polesitter Erik Jones and Ryan Blaney. But Allgaier was far from home free. 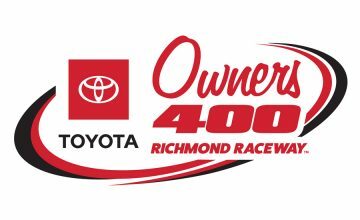 A caution for Ryan Reed’s spin in Turn 2—under hard racing against Darrell “Bubba” Wallace Jr.—slowed the field for the fifth and final time and set a restart with seven laps left. Once again, Allgaier surged into the lead, with Jones chasing. But Jones had changed lanes and moved to the outside of Sadler before he reached the start / finish line and was slapped with a pass-through penalty that ended his winning chances. Allgaier took the checkered flag 1.772 seconds ahead of charging Kyle Larson, who fought back from a late pit road speeding penalty to finish second. Sadler came home third, followed by Daniel Henric and Austin Dillon. 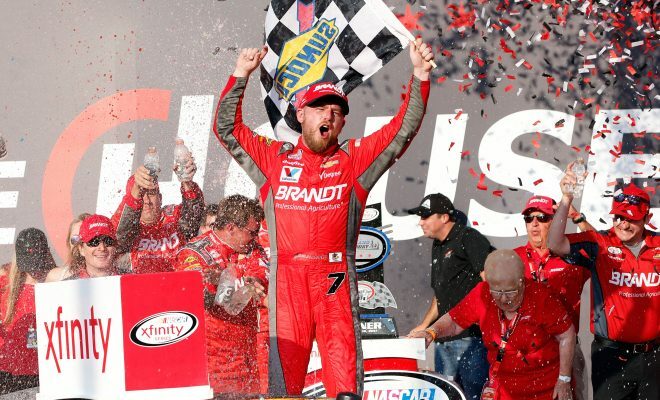 “This is incredible, man,” said Allgaier, who won for the second time this year, the second time at Chicagoland Speedway and the fifth time in his career. “I’ve been fortunate enough to go to Victory Lane here before, but on fuel mileage. As Allgaier made the most of his opportunity, his most formidable competitors suffered from self-inflicted wounds. Jones, who led 94 laps, and Blaney, who led 28, both drew pit road speeding penalties under caution during the break between the second and third stages and had to fight to regain track position. Larson’s speeding penalty on Lap 182 came too late for the driver of the No. 42 Chip Ganassi Racing Chevrolet to claw his way back to the front. 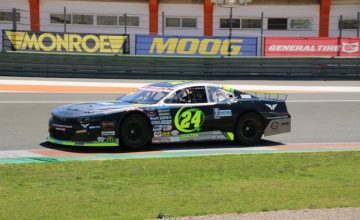 Battling to preserve a 25-point edge over Dakoda Armstrong for the last of 12 playoff berths, Gaughan slowed dramatically during the second stage as he fought to keep his No. 62 Chevrolet off the wall. But Gaughan finished the stage, eventually got his three laps back—thanks to three cautions in the last 50 laps—and qualified for the Playoffs. “I think the last time I had an equalized tire was in Winston West racing,” Gaughan said. “Man, we held on for dear life for that session. Three more laps, and I’ve got a top-10 out of it!